This is one of those post that as been delayed for a really long time because I think I am still searching for words to describe my experience. 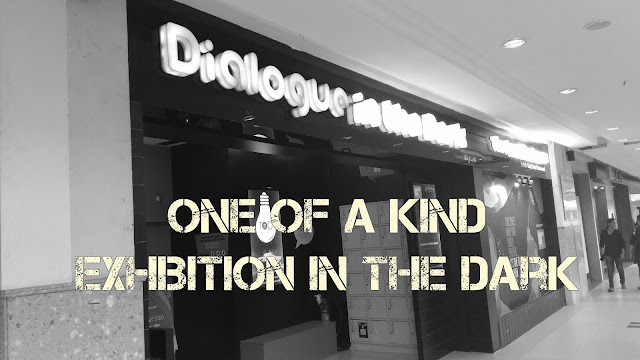 Located on the 3rd floor of Express Avenue, Dialogues in the Dark is a one of a kind, Dark exhibition centre. They also have a restaurant attached, which is also in the darkness. Recently aka a month ago, they held an exhibition in association with Jewlot, where we got to experience jewellery, in the dark. So what was it like? Honestly, it was nothing like I have ever experienced before. If you are that person who peeks through the blindfold while playing blindman's buff, well this is a game that will definitely be a challenge for you. It is pitch dark in the room. I think pitch dark is an understatement. In fact I have no idea if it was a room or a long corridor. I was lead by a guide, Janaki, and all I had a stick and her voice to take me through it. The meaning of "walking blindly" took on a whole new perspective in the darkness. I was amazed at how keen my senses were when my ability to see was cut off. Imagine being able to know that you can see, but all you see is this eerie darkness. It makes you suddenly wonder if you do still have the sense of vision or not. You have no idea if you are going forward or backward or round in circles. You are completely dependent on someone else in a new place. Image the trust you need to be able to have to just follow that person's voice. All you need to be able to do is to let go and allow yourself to enjoy it. Take in the sounds, smells and what you feel along the way. The entire experience is for about 30 to 45 minutes depending upon how long you can handle it. Some people get extremely freaked out in the darkness and some people feel claustrophobic in there. So definitely enter with caution. Having said that, I think it this experience in the darkness is one you must have in order to truly have your eyes opened. I know I came out with my eyes moist and my heart lighter. So why is it called Dialogues in the Dark? Well that's a secret for you to find out when you go there. 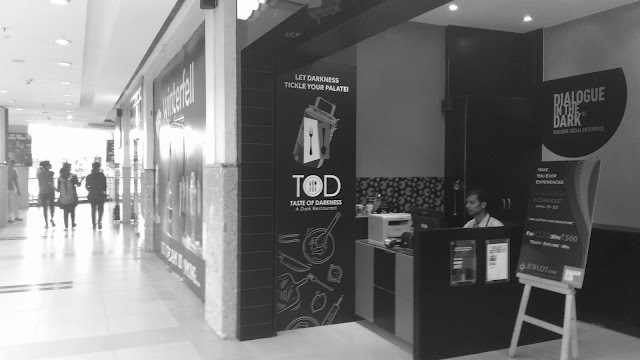 Dialogues in the Dark is also there in Hyderabad, Bangalore and Raipur. So do check it out when you can.